When I came back from my walk this morning, as I was turning some lights on in the family room, I noticed that Weasley was purring and trying to get my attention. He does that sometimes when he thinks I'm going to go sit down so he can rush and sit on my lap. He's so neglected! But when I get back from walking, he knows it will be a while before I sit down. So it wasn't that. Then I glanced down. And had to look again. No, that wasn't a toy mouse. Weasley caught and killed a mouse, and he wanted to be sure I knew about it. That is the first I knew about any mice in the house. I'm re-reading the post I shared recently about getting rid of unwanted pests, and we haven't noticed any signs. So we don't know where the little guy came from, how long he was here, or if there are any more. 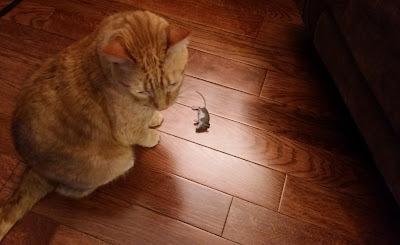 But at least now we know Weasley can catch and kill a mouse - or at least play with it to death. After he'd shown it to me - and I made sure to let him know what a good boy he was - he again started playing with it, tossing it around and chasing it, purring all the while. 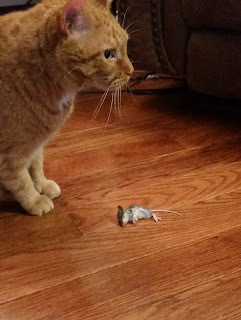 So I gave him some cat treats, bagged it up, and took it outside to the trash toter before he could lose it under some furniture somewhere like he does with most of his toys.